On the Origin of Species. 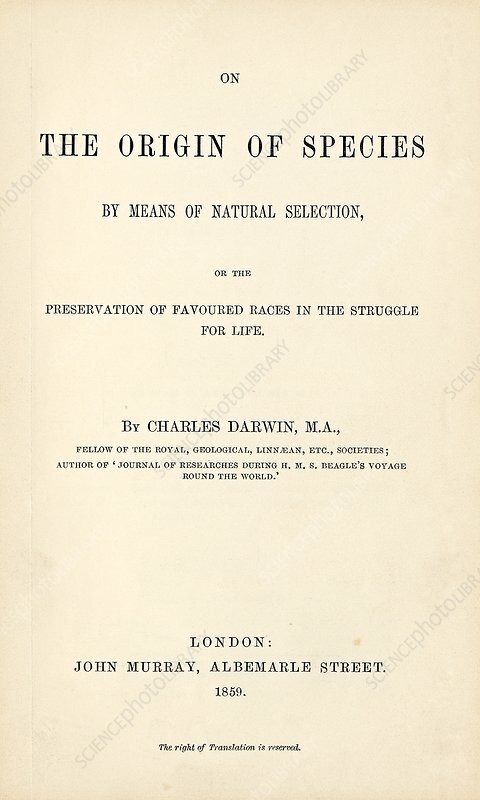 Title page of 'On the Origin of Species by means of natural selection, or the preservation of favoured races in the struggle for life', published in 1859 by the British naturalist Charles Robert Darwin (1809-1882). Detailing his theory of evolution by natural selection, this is Darwin's most famous work. The title page names him as a fellow of many scientific societies, including the Royal Society, the Geological Society of London and the Linnean Society of London. Also mentioned is his research voyage on HMS Beagle. This first edition was produced by the London publishers John Murray.